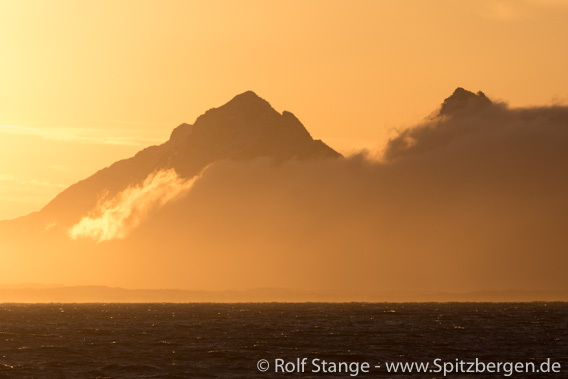 We are at the bottom of Vestfjord today – that is the sea area between the Norwegian mainland and Lofoten – in the area that is called „Ofoten“. The “L” of “Lofoten” is missing here, we’ll get that tomorrow, a bit further to the west. Tysfjorden is Norway’s deepest fjords, with depth down to almost 900 metres. 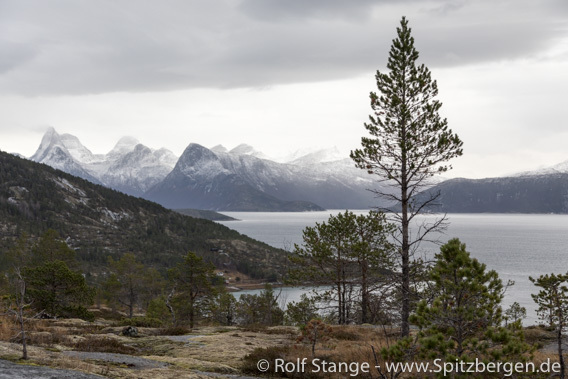 The ice-age glaciers have almost cut Norway into two parts. There is no more than 6 kilometres of land between the coast and Sweden. Icicles next to the path on Skarberget. Captain Mario gets the Antigua alongside at the jetty in the little harbour of Skarberget with an impressive maneouvre. We follow the road for a little bit, than a way into the forest and finally a path between small trees and over mosses, lichens and bare rocks, up a ridge. 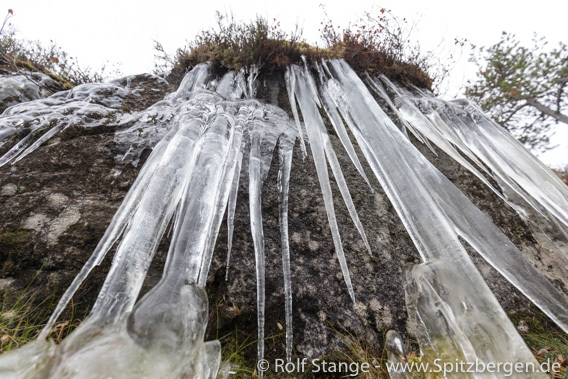 There is ice on the rocks in some places, so it is quite slippery and we have to be careful. View from Skarberget over Tysfjorden. But the view of Tysfjorden from Skarberget is absolutely worth it. It is cold and windy and it is getting more and more grey and wet, so it is nice to get back to Antigua after a few hours. The clouds are breaking up as we continue, and the low sun casts spectactular light over the islands and mountains around us. Evening light in Ofoten – directly after lunch. In dwindling daylight and a stiff breeze it is again an impressive bit of seamanship as Captain Mario maneouvres good old Antigua into the little harbour of Tranøy. This is a little settlement in the northern part of Hamarøy. As many as 53 people lived here in 2012. 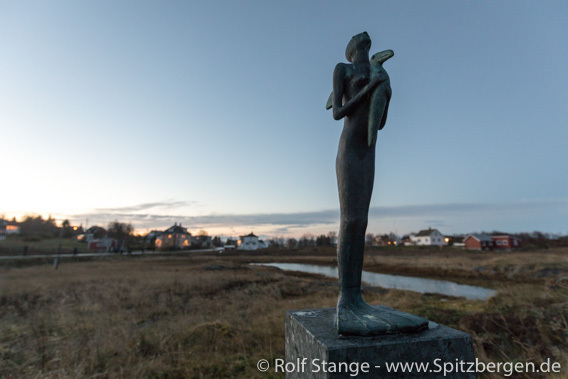 There are some sculptures hidden in various places in Tranøy. It is a good walk across the peninsula to the lighthouse and it is almost dark as I finally get there. Unfortunately the cloud cover is pretty much closed again and it even starts to rain, so there is little hope for northern lights tonight. 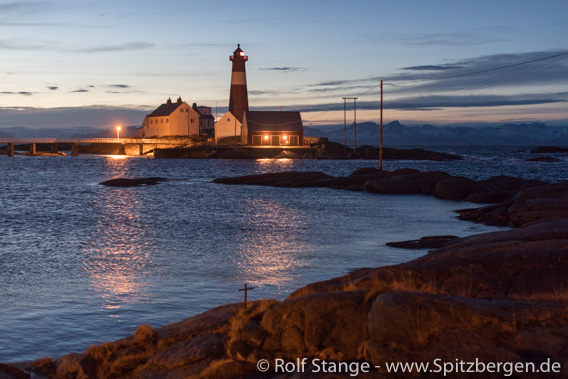 Lighthouse of Tranøy in twilight.